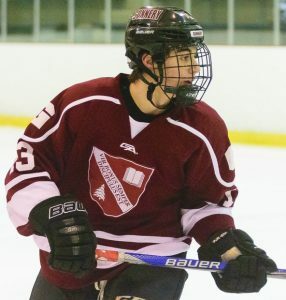 A big incoming class could mean some more success this winter for the Cadets, who strive to be hard to play against and be a fast team, moving the puck quickly. Post-grad Kevin Quinn and senior Sean O’Gorman are two key holdovers up front for coach Stephen Needham. 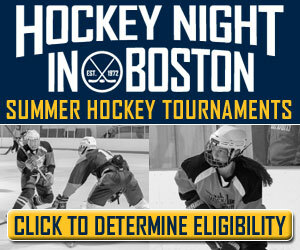 Post-grads Anthony Bono, Liam Quinlivan, Anthony Quinlivan and Donny Feldman all bring their offensive talents. New junior John Goldowski and post-grad Andrus Kulbis-Marino will have key roles. Senior Zach Mouzakes and junior Owen Hebert are two experienced blue liners to build around. Post-grad Mikas Kulbis-Marino will be a force, while newcomers Kaleb Rathbun (junior), Nolan Towne (junior) and Jack Caroll (sophomore) will look for key roles. In goal, post-grad Kyle Penton will challenge for the top spot between the pipes. The Bears hope to build on the success they had at the end of last season, where they won six of their final eight tilts. 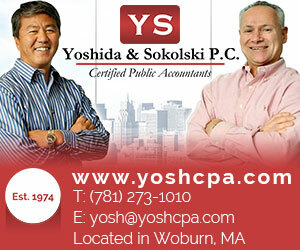 This year’s team will be young, but with some experience. The Gammill brothers – senior Brooks (Colby commit) and junior Briggs (Yale commit) will lead the offensive attack for coach Dan Driscoll. The forwards lines also see back seniors Thomas Horak and Mike Grise, juniors Jack Whitney, Jack Bavis, Oliver Cookson and Griffin Grise, and sophomore Hayden Riva. Logan Green and sophomore Jack Marottolo are a pair of new forwards ready to challenge. On defense, junior Cade Alami should be a major factor; he has committed to Providence. Seniors Aidan Metcalfe and John Pratt are back as well. Post-grads Jake Lachance and Elias Cohen, new junior Max O’Brien and freshman Nick Donaldson bring their talents. 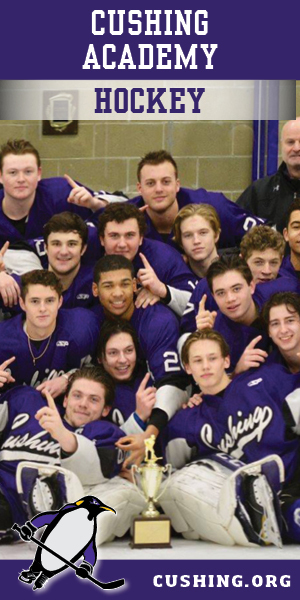 Sophomore Jed Ballotti saw a little time in the Berkshire cage as a ninth grader last winter. Post-grad Ken Burgess joins the club in the nets as well. 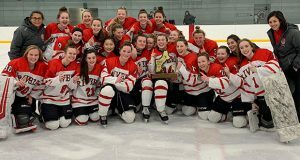 A playoff team the past four seasons, the Bruins capped the run winning the New England Large School title last year, ousting Thayer 4-3 in OT. This year’s club will be defense-oriented. Longtime assistant Michael Kennedy has taken over the head coaching job, with Ron VanBelle who had been head coach for 13 seasons, serving as an assistant. Senior Charles Shaffer (35 pts), a four-year letterwinner, will lead the Brunswick offense. Senior Aaron Aboodi is back as well. A talented sophomore group includes Paul Davey (Boston College recruit), Ryan St. Louis (Northeastern commit) and Matt McGroarty. A new sophomore to the group is Mike Salandra. Senior book-ends Cooper Moore (21 pts) and Henry Hill will be crucial to the Bruins defense. Junior Shayan Farjam is another expereinced blue liner. A pair of new juniors – Jude Brower and Connor Sullivan – give the group even more depth. 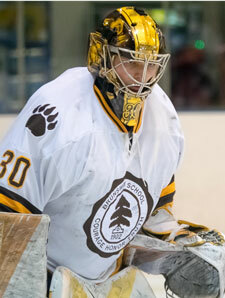 Also back is senior goalie Dan Dachille, who fashioned a 2.15 gaa in over 1,500 minutes of action last year. Attitude and effort will be keys this winter for the Saints, who project to be young on defense and have some inexperience up front. Seniors Matt Iasenza (20 pts) and Raif Harris (10 pts) will be asked the carry the offensive load for coach Paddy McCarty, along with junior Zach Riccitelli (14 pts). In goal, senior Connor Cherry is the only returner. He will look to win the #1 job during the pre-season. Depth up and down the lineup will be a big plus for the Highlanders, who reached the Small School semifinals a year ago, losing a tough OT game to eventual champion Lawrence Academy. With that depth, coach Craig Badger says that team chemistry will be vital. Amongst the key returners up front are junior Mark D’Agostino (29 pts), committed to UConn, and seniors Riley Brennan (18 pts) and Mason Beecher. 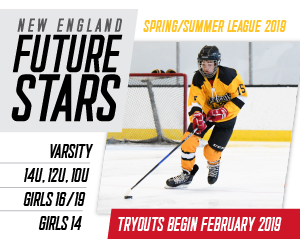 The program’s new talent features seniors Robert Cronin and Case Kantgias, juniors Alex Jefferies (Merrimack commit), David Andreychuk and Jeff Kopek, and sophomore Aden Hotchkiss (Sacred Heart commit). A solid crew returns on the blue line with seniors Alex Coady (13 pts) and Niko Ioannou (16 pts) joined by juniors Jimmy Rayhill (12 pts – Cornell commit) and Hunter Sansbury (17 pts). New junior Zander Lizotte and junior Reed Dolph gives the Highlanders even more talent at the position. Senior JP Mella saw the vast majority of time in goal last winter for Gunnery and returns for another big year. Junior Carmine Andranovich is also back in the fold. A beefed up schedule greets the Owls as they embark on the 2018-2019 season. New head coach Tim Wolford, who says system play and simple, smart hockey will be his teams bread-and-butter this winter. 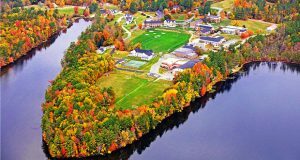 Last year’s head coach – Brett Heigl – is now Hoosac’s Associate Head Coach. Up front, senior Noah Dontigny (33 pts) will certainly be a catalyst, returning along with senior Simon Delden (15 pts) and post-grad Maren Lancaster. A bevy of newcomer forwards will bring some good offensive depth in senior Itay Mostovoy and Jacob Greenholz, juniors Manny Cabral, Sebastian Tigerheilm, Ronny Paragallo, Ryan Davis and Jeremy Ducket, sophomore Bauer Ward, and freshman Ezra Gale. Returning post-grad defenseman Richard Colarusso will be joined on the blue line by juniors Tyler Drummond, Chen Zadik, Ronald Bregante and Cooper O’Neil, and sophomore Seth Robinson. In goal, senior Gabriel Pigeon, sophomore Gavin Belton and freshman Hunter Cunningham will fight for time. Despite losing some key players, Millbrook coach Vincent Sorriento feels good about his returning group and his new players, and is both excited and optimistic about the upcoming campaign. The Mustangs do bring back three forwards who will be huge to any success in senior Jake Gagnon (45 pts), senior Jason Ruskowski (15 pts) and senior Ryan Pitoscia (14 pts). The new guys ready to make an immediate impact are seniors Ethan Abraham and Andrew Peters, junior Kyle Neudorf and sophomore Griffin Tominez. Backboning the defense is senior Owen Nolan (25 pts), who has committed to Army. Seniors Stu Martin and Dilan Peters return as well. New junior Nick Degaetanni should have a big role. Returning senior starter Cam Fernandez will be a solid presence in goal. New sophomore Owen Haines is in the rotation. 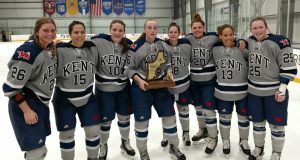 The Griffins stumbled a bit last winter after winning the New England Small School title in 2017. Things look promising this year, with a lot of depth on the roster. 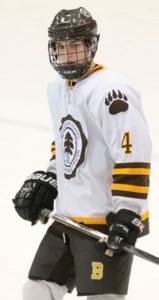 No less than eight forwards return with seniors Sean Hurley, Dylan Weishelbaumer, Wells Robinson and Ryan Saunders, and juniors Kyle Tomaso, Tyler Bourque, Sami Hakkarainen and Tyler Mitchell back in the fold. New junior Will Rosen and sophomores Cam Lowe and Joe Cantelmo add depth to the mix. Defensively, coach Matt Goethals has back seniors Landon Krikorian, Nate Schuman, Jamie Kellogg and Will Gould, and junior Ryan Kosinski. Post-grad Chris Verstandig will battle hard, while new sophomores Hans Forselius will fight for time. Senior Peyton Durand gives the Griffins a chance each and every time out between the pipes. The Wildcats fared quite well last season in their Fairchester Athletic Association, but have some holes to fill this year. Coach Brett Farson is counting on a talented trio of forwards to build off last season’s success in seniors Jack Kissell (43 pts) and Josh Cohen (40 pts) and sophomore Charlie Keating (35 pts). A pair of new forwards to watch are sophomore Charlie Smilovic and freshman Daniel Hu. Only seven players return from last year’s outfit that got the #4 seed in the Large School Tournament. So, you can say that coach Derek Cunha has his work cut out for him. He did bring in a solid new group. Up front, seniors Cam Mariani, James Belleavoine and Hunter Sarro look for bigger offensive roles. 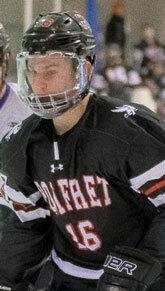 Sophomore David Novotny had seven goals as a freshman. Sophomore Brandon Barrett is back as well. 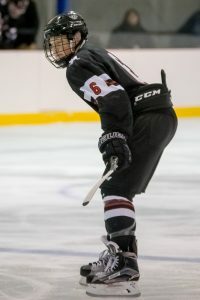 A host of new forwards includes juniors Tommy Harty, Jake Sacratini, Matthew Pimental and Shaul Mitton, sophomore Richard Stefanik and post-grads Brendan Nehmer and Jack Purcell. 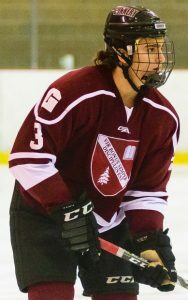 Senior captain Tim Rego (15 pts) is a veteran presence on the Williston blue line. Senior Alex Berg will be an anchor along with Rego. Newcomers hoping to make a splash are junior Mitchell Hansen and sophomores Tyler Varin, Zach Gmerek and Hunter Wilson. Two new goaltenders ready to handle the job are post-grad Kyler Breland and junior Trevor Corsello.